Aretha Franklin's homegoing service was held at Greater Grace Temple in Detroit. This sign sat on a hearse outside of the church. "She was bathed in the black church. And she took the black church downtown and made folks that didn't know what the Holy Ghost was shout in the middle of a concert," said the Rev. Al Sharpton, who spoke at the service. All throughout the week, fans from around the country flooded Detroit to pay homage to the Grammy Award-winning megastar as Franklin lay in repose. At the funeral, Detroit Mayor Mike Duggan said that for more than half a century, the Franklin family had a huge impact on the city. Franklin's father, C. L. Franklin, was a prominent minister who organized one of the largest civil rights marches in Detroit. And then came Aretha. "Each time she soared, it felt like the people of Detroit soared with her because she never lost her connection," Duggan said. Other speakers remembered the woman with the legendary voice for a life full of singing and activism — like the time she traveled with singer Harry Belafonte to raise money for Martin Luther King Jr. and the civil rights movement. The Rev. JoAnn Watson, a close friend, said Franklin was especially devoted and generous to her hometown. "She would ride the streets of Detroit, taking note of people who have special needs, quietly dispensing donations," Watson said. There were lots of bittersweet moments like that throughout the service. Ushers roamed the aisles with boxes of tissues. Franklin's reach was worldwide. She sang for presidents and former ones. Barack Obama and George W. Bush sent letters that were read aloud to the congregation. And the crowd laughed when President Clinton played Aretha Franklin's song "Think" on his cellphone during his tribute. For Franklin's family, the loss was much more intimate. Her granddaughter Victorie Franklin said when she was young, she didn't recognize the fame of a woman others consider music royalty. But that changed. "And when I would go to her shows and watch her sing, it would be the best feeling in the world," Victorie said. "Nothing sounded better to me than the way my grandma sings. Her voice made you feel something. You felt every word, every note, every emotion in the songs she sang. Her voice brought peace." One of the most poignant moments came from singer-songwriter Smokey Robinson. He met Aretha when he was 8 years old. He said he wasn't expecting to say goodbye. "I'll miss you, my buddy. I'll miss you, my friend. I know that my love for you will never end, will never end," Robinson sang. Aretha Franklin had a voice that stirred the soul and changed popular music forever. In a nod to her hit song "Freeway of Love," pink Cadillacs led the procession to Woodlawn Cemetery, where she is now buried. 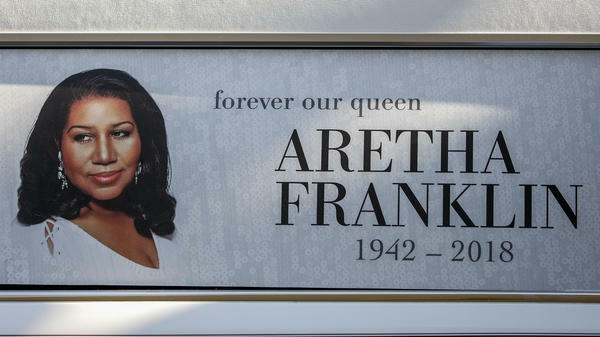 A weeklong tribute for the Queen of Soul came to a close in Detroit yesterday. Thousands turned out for Aretha Franklin's funeral at Greater Grace Temple to celebrate a superstar and her musical legacy. NPR's Cheryl Corley reports from Detroit. ARETHA FRANKLIN ORCHESTRA: (Singing) Walk in the light. Walk in the light. CHERYL CORLEY, BYLINE: This was a celebration, a daylong tribute full of stories about Aretha Franklin's impact. There was politics and humor but, most of all, music. ARETHA FRANKLIN ORCHESTRA: (Singing) Of mercy shine bright. Shine on. CORLEY: There was a who's who with big names in music, sports and politics - The Clark Sisters, Ariana Grande, former basketball star Isiah Thomas and former President Bill Clinton. The missing voice was Aretha Franklin's. The Reverend Al Sharpton. AL SHARPTON: She was bathed in the black church. And she took the black church downtown and made folks that didn't know what the Holy Ghost was shout in the middle of a concert. CORLEY: All throughout the week, fans came from around the country to pay their respects to the Grammy Award-winning megastar as Franklin lay in repose. At the funeral, Detroit Mayor Mike Duggan said for more than half a century, Aretha's family had a huge impact on the city. Franklin's father was a prominent minister who organized one of the largest civil rights marches in Detroit. And then came Aretha. MIKE DUGGAN: Each time she soared, it felt like the people of Detroit soared with her because she never lost her connection. CORLEY: And the mayor brought the crowd to its feet when he said a popular park would be renamed for Franklin. There was a sense of history in the room as speakers recognized the woman with the legendary voice for a life full of singing and activism - like the time she traveled with singer Harry Belafonte to raise money for Martin Luther King Jr. and the civil rights movement. Reverend JoAnn Watson, a close friend, says Franklin was especially devoted and generous to her hometown. JOANN WATSON: She would ride the streets of Detroit, taking note of people who have special needs, quietly dispensing donations. CORLEY: There were lots of bittersweet moments like that. Ushers roamed the aisles with boxes of tissues. Franklin's reach was worldwide. She sang for presidents, to former ones. Barack Obama and George Bush sent letters. And the crowd laughed when President Clinton played Aretha Franklin's song "Think" on his cellphone. For Franklin's family, the loss is much more intimate. Granddaughter Victorie Franklin said when she was young, she didn't recognize the fame of a woman others consider music royalty. But that changed. VICTORIE FRANKLIN: And when I would go to her shows and watch her sing, it would be the best feeling in the world. Nothing sounded better to me than the way my grandma sings. Her voice made you feel something. You felt every word, every note, every emotion in the songs she sang. Her voice peace. CORLEY: One of the most poignant moments came from singer-songwriter Smokey Robinson. He met Aretha Franklin when he was 8 years old. He said he wasn't expecting to say goodbye. SMOKEY ROBINSON: (Singing) I'll miss you, my buddy. I'll miss you, my friend. I know that my love for you will never end, will never end. CORLEY: Aretha Franklin had a voice that stirred the soul and changed popular music forever. In a nod to her hit song Freeway of Love, pink Cadillacs led the procession to Woodlawn Cemetery, where she is now buried. Cheryl Corley, NPR News, Detroit. Transcript provided by NPR, Copyright NPR.